If you’re thinking about starting a garden, the first thing you need to consider is what type of garden you will have. There are many different choices and often it can be hard to pick just one, but hopefully you can narrow it down. But by narrowing it down, you’ll make the gardening experience easier on yourself and the plants. If all your plants are similar, then it shouldn’t be very hard to care for them all. So here are some of the main garden ideas for you to choose from. If you do a quick internet search for your area, you can probably find a list of flowers that will bring your flower garden to life. 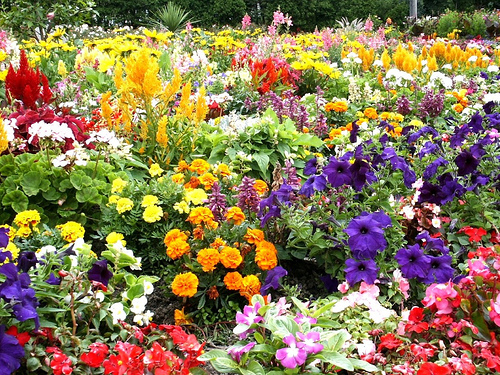 These usually only require work in the planting stage – after that, the flower take care of themselves. The only downside to this is that you don’t have any product to show for it. Another choice for your garden is to have a vegetable garden. These usually require a little more work and research than a flower garden, but can be much more rewarding. No matter what time of the year it is, you can usually find one vegetable that is still prospering. That way you can have your garden be giving you produce almost every day of the year! One of the more difficult types of gardens to manage is a fruit garden. It’s definitely the most high-maintenance. When growing fruits, many more pests will be attracted due to the sweetness. You not only have to deal with having just the right dirt and fertilizer, you have to deal with choosing a pesticide that won’t kill whoever eats the fruits. Your fruit garden will probably not produce year-round. The soil needs to be just right for the plants to grow, and putting in another crop during its off-season could be disastrous to its growth process. If you’re willing to put lots of work into maintaining a garden, then a fruit garden could be a good choice for you.